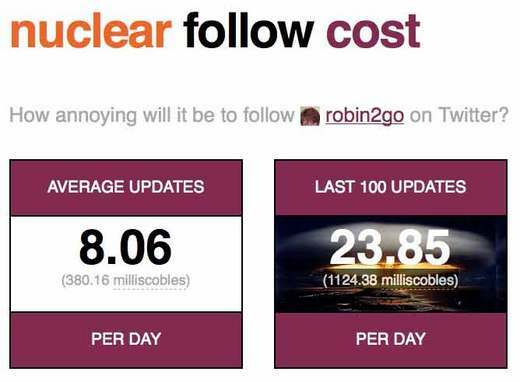 Yesterday my twitter feed started talking about follow cost, a lovely little site that calculates your average updates per day, as well as the rate of your last 100 updates. Of course, I always like to try out new gimmicks, so I entered my twitter ID and got my result. I have to admit, there were cute messages while the page calculated and did its thing, but then the result was revealed. As twitter asks “What are you doing?” so does follow cost ask you, gentle reader, “Is robin2go worth the pain?” You might figure that the answer, direct from the horse’s mouth, is a resounding “NO!! For the love of God and all things holy, do not follow! Run for your lives!” Resulting graphic after the fold. As if the nuclear cloud wasn’t visual enough, the original page shakes, then refreshes itself while adding that gloriously neon “nuclear” to the “follow cost” header. Nice. (once again, PSU students riot to show their support and stupidity) all in one fell swoop. I mean, of course I had to comment; I mean, what’s football without the cheers and groans? It really was funny; perhaps I’ll grab the tweets later and post ’em. from the ledge: @kevinoshea, a Purdue tweeter, and one of my local faves, @meeshiefeet.